Jeff showed up one evening smack dab in the middle of class. Seeming distraught and disheveled, he asked if someone could help him. Earlier that day, one of the clergyman from a local Catholic church had called us and asked if we knew how to minister to the demonized, he had heard through the grape vine that we knew how to heal the hurting and oppressed. He said he had someone there with him and he didn't know how to help him. Jeff (the name I've chosen for him for the purposes of this story to protect his privacy) was that man. One of my leaders offered to take him to a private place to see what he could do for him right then. I was teaching at the time and continued on with the class. Sometime later, before the end of class, Jeff and the leader emerged from the room and Jeff was looking so much better and skipped out with a happy face. Jeff waved and said thank you. His whole countenance had changed. The leader told me later that he had been hearing voices and wrestling with some demonic activity around him and on him. Through a little prayer, counsel and casting out of evil entities, Jeff had found relief. A few weeks later Jeff showed up again, looking a little out of sorts. I invited Jeff into my office. Jeff was disheveled, confused, hearing voices and picking "bugs" off of his arms. Also, Jeff was slightly levitating from his chair and having convulsions in his legs and arms when we began speaking with one another. Those signs gave me the heads up that we were dealing with multiple things and the strongholds involved were really powerful and had taken over. I was alone in the prayer house this time. It was the quiet time of day, until now. "How are you today, Jeff?" "I'm having a rough time. They won't leave me alone." He said. "The bugs and the voices, can't you hear them and see them all over me?" he asked. "No, I can't. What are they saying?" "Oh, they want to hurt you! They said they don't like you. They want me to (made a choking motion) do this to you. They are screaming now." He said. Me, and my completely calm self asked him "Do you know why they want to hurt me? It's because I can make them go and they don't want to. I have something to say about that." Looking at Jeff, right in the eyes I said this "You are a beloved son, you are holy and blameless, you are covered by the blood of Christ, you are new, you are clean and you are good..." I began to declare over him. Big giant tears flooded his eyes and rolled down onto the carpet. He began to weep and his whole expression and demeanor changed. "Tell me what is happening, Jeff. How are the voices now? The bugs?" "The voices are silenced, I cannot hear them. The bugs fell to the ground and rolled outside of your office door. I feel like myself, so much better but I am scared. Are they waiting there? I am afraid they will come back." "I am not sure Jeff, I don't think we are done yet for today. Give me a minute and I will ask what Jesus wants to do. Can we do that together?" "Yes, whatever we need to do." He said. I sat there for a second and listened to Holy Spirit. What Holy Spirit instructed me to do next was very unusual. He asked me to have Jeff stand at my open office door and look into the prayer room and tell me what he saw, so I did. Jeff looked into the prayer room for a minute. "I see an angel standing at the altar, a big one." He said. "Go to the angel and ask him what to do next." I prompted. I watched Jeff walk to the middle of the stage (the altar) in the prayer room and he knelt down. Jeff began to make motions as if he was taking a shower. No one else was there to disturb him, I watched him for a while. Then he lied down, it seemed like he was napping there. I walked back to my desk away from the door and started working on a few things while I waited for him to finish. Suddenly he appeared back in my doorway looking refreshed. "You look great Jeff. How are you feeling now? Tell me what happened." "That was crazy! I went to the angel and he said he wanted to cleanse me. It felt like a waterfall flowing from him. I was cool water, almost minty. I washed myself there. Then the angel had me rest there at his feet, so I did. He told me one thing I didn't understand though. The angel told me to give you my black dog tags. Why would he tell me that? He said you would know." Jeff replied. "Tell me about the dog tags, Jeff. Were you in the military?" 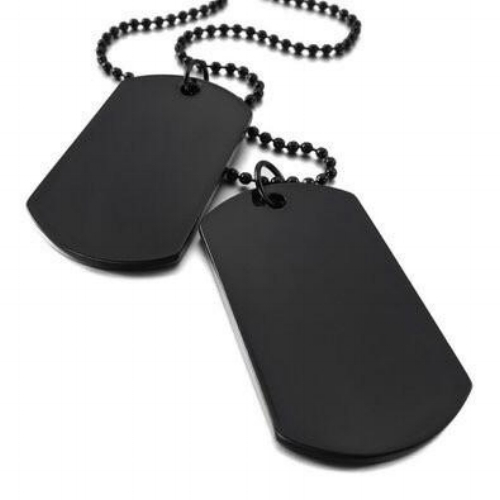 "I was in the military, but the black dog tags are not my military issue. They are personal. A former girlfriend gave me these tags. They have sentimental value. I don't know why the angel would have me give them away to you. But I know I have to give these to you. Can you keep them here though, in case I ever need them or want them back? I am afraid though, that they will haunt you and cause you pain. Is that even possible? That thought just came to me." Jeff replied. "I believe that the angel is showing you something about those dog tags that is at the root of where your problems began. I believe he wants to break the unholy tie you have with this girl and the curses attached to these tags. We can break the power attached to these tags. By the way, those tags have no power over me. The authority and power Christ gave me is greater and far above any curse or tie attached to any object. The same power is in you, if you are in Christ. Are you?" "I believe I am. I've accepted Christ." I asked him to tell me more about his history before we proceeded with any prayer. Jeff told me the problems began four months back when he was sent home from Afghanistan when he was injured on the battlefield and needed back surgery. His then girlfriend (the one who gave him the black dog tags) broke up with him at the same time. Jeff had been recovering from the surgery and was given a multitude of medications and was trying to deal with post-traumatic stress. All of these things were converging when the voices and the bugs began to appear. I listened to his story for quite sometime, all the while listening for Holy Spirit to give insight and guidance into where to go next. I didn't believe his presenting problems were only that of demonic activity, even though I could cast them out. They were there for a reason. I believe what was happening with his mind was also contributed to by the medications not interacting well together. I also believed the trauma from the Afghan war was triggering him and opening a road for demons to attach through emotional and physical pain. The tie to the girlfriend, sexual sin and possible introduction to the occult through curses and unholy ties was also making way for the demonic realm to be introduced to him on tangible levels. Fear. Hate. Sexual Sin. Occult. All of these are open roads for the enemy to travel in and out of person. Even if one is in Christ, we can give permission to other things to permeate our beings. We have that much power over ourselves and in places in which we have authority. That is an eye opener for many. Even if we have willingly or unknowing opened ourselves up to things, we surely have the power to shut those things down and close open roads. If there is one thing I've learned in working with people in this way, is to stay in my lane. I am not a medical doctor. I am not a psychiatrist or psychologist. However, I am a minister of the gospel and can deal with the supernatural and spiritual aspects of life. That is precisely what I worked on with Jeff that day. I prayed with Jeff regarding all of those areas of wounding. Fear. He was afraid of many things connected with his war trauma. He had hate connected with his experiences in war, including government decisions and authority figures. Jeff had sexual sin with his girlfriend and while in the Middle East. He encountered the occult through spoken words over him, curses on the black dog tags, and other practices he had been apart of while over seas in the military and some to do with the pharmaceuticals. Part of my work with Jeff was referring him back to his physicians regarding his medications and his pain. I also recommended he consult with counselors to work on his trauma and other mental disorders that might be present. I counseled him that the power to stay free was in his hands. I told him it was important that he keep his eyes on Christ and not the power that had him bound. I gave him several other keys that would help keep him keep clean, primarily keeping his connection with Holy Spirit open for direction like he had when he encountered the angel. I had a concern that I didn't feel had been resolved. Even though he renounced the occult in my office that day. Something told me it wasn't complete. He was still infatuated with the power of the occult to influence him and others that way. I knew that mindset probably wouldn't be resolved that instant. That would have to be something he had to work out with Jesus or revisit at a later time. He had enough to chew on for a while. The change in Jeff had been so remarkable, that his parents asked Jeff to bring them there so they could find out what happened to him. His parents only spoke Spanish but Jeff translated for them. "Our son is so different, he is not hearing voices anymore and not acting crazy. How did he get that way and how did you fix him? No doctor has been able to help him before he met you. Only you have been able to help him. Help us to understand. Will he get sick again?" his parents asked. I explained a little of what was going on with Jeff without revealing too much and maintaining his privacy, just so they could understand a little of how the Spirit was working to heal his body, soul and spirit. As far as getting sick again, I told them anything was possible. He could stay free but freedom is a choice. I didn't see Jeff for a long time. However, he did return. So did the voices. So did the confusion and disorientation. My encounter with him was brief. Jeff came in, he greeted me and informed me that he was returning to his home state and he wanted his dog tags back. I asked him if he needed any assistance and he said "No, thank you for all you have done for me. I just came to get my dog tags back so I can leave California and go home." I had his tags in my desk, and returned them to him promptly, wishing him the best. I was hoping he would never come back for them. My heart was sad when he did. What I know is that people have a free will and make their own choices. All I can do is love them and be a constant force of support for those whom God loves, which is every single person. I will continue to pray for Jeff, as I still do for everyone whom I've encountered. I believe that God will continue the work He has begun in the life of Jeff and everyone He has created. I was correct in the fact that he was indeed far too infatuated with the power of the enemy. Yet, I believe the power of Christ is supreme. Christ has already won, even if our finite selves haven't caught up to his omnipotence.